One of the reasons that subscription businesses like LootCrate and BirchBox reigned was their smart affiliate marketing campaigns. We wanted to do more than offer you a billing solution. So, we partnered with LeadDyno, so you can ace your affiliate marketing strategy. You can also manage your affiliate recruitment and commission strategy for your marketing program. Recruit affiliates and invite your customers to join your affiliate program with automated email marketing. Payouts to your affiliates via PayPal is a breeze. Stay in touch with your Sales and Marketing with the daily activity report on your affiliate program. 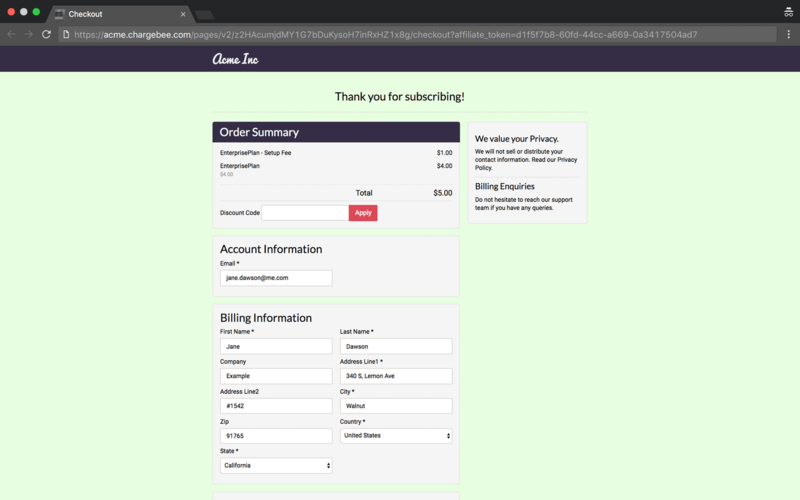 All you have to do is install a minimal JS on your site and LeadDyno will track the affiliate conversions. Build an army of affiliates and partners and manage your customized affiliate programs with Chargebee and LeadDyno. Track affiliate leads and conversions automatically, when new customers sign up. Launch affiliate marketing programs on the go. Learn more about how Chargebee and LeadDyno can help you augment your sales pipeline. Have complete control over your affiliate management program. 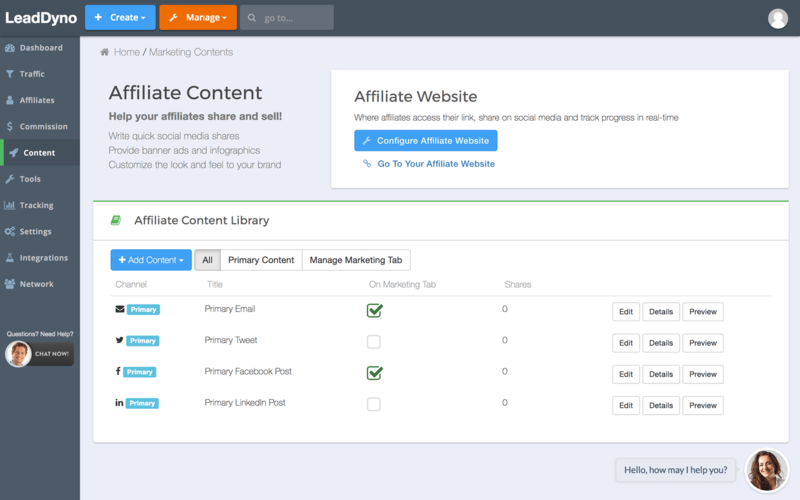 Add, modify and approve affiliates in seconds. Let your affiliates track the progress of their affiliate program from Chargebee, with LeadDyno’s dashboards user-friendly and crystal clear dashboard. LeadDyno is built into the hosted pages ensuring the fastest method of setting up a an affiliate program. Custom integration is also possible for users leveraging the API. Incentivize affiliates to recruit other affiliates by giving them additional credit for any purchases that their sub-affiliates generate, with multi-level marketing. Visit LeadDyno to learn more about setting up this integration. What plan does the Chargebee - LeadDyno integration fall under? 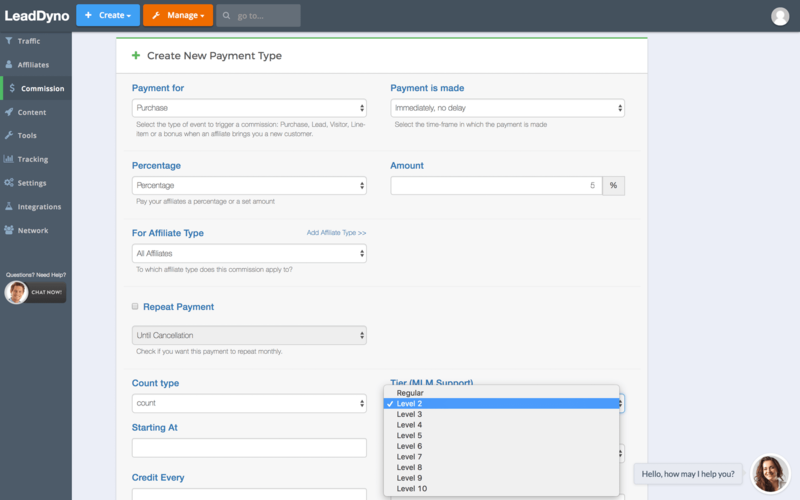 Can I enable the LeadDyno integration if I am using Chargebee’s hosted pages for checkout flow? How do I get the LeadDyno affiliate id from LeaddDyno cookie? How do I enable Chargebee - LeadDyno Integration, if I am using Chargebee’s complete API integration? 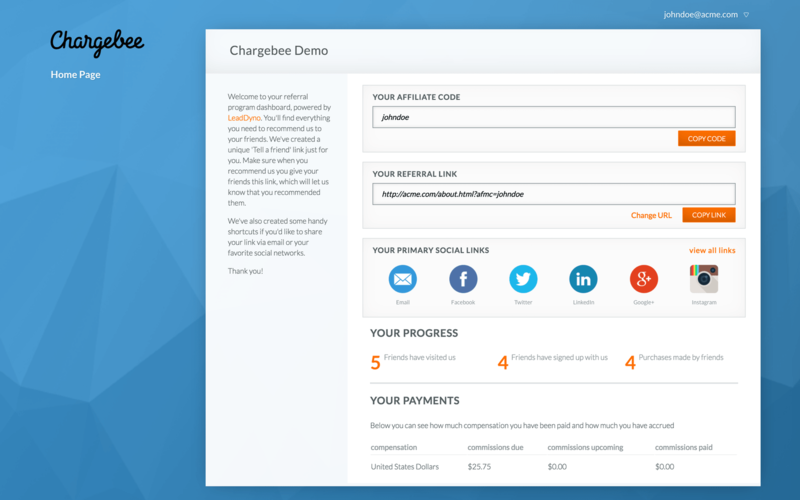 Chargebee’s integration with LeadDyno is available across all plans. If you are using Chargebee’s complete API, there’s an extra step you need to take for completing the integration i.e. passing the “affiliate_token” input param as the LeadDyno affiliate ID while calling 'Create Subscription API'. You can find more information here.